A total of 405 years of service to the company was recognised by the directors of East Yorkshire Motor Services at their annual Long Service Awards function last Friday, 21 November. When the service of wives, partners and officers of the company are included an amazing total of 607 years service was represented in the room containing just 32 people. Paying tribute to the recipients of the Awards, all from the Hull and Withernsea offices, EYMS Group chairman Peter Shipp said there could not be many companies these days who could have an awards dinner featuring six employees with 35 years service, two with 40 years, and two with 45 years service which he described as an incredible achievement. In addition one driver was presented with a 25-year award, but unfortunately the other Hull driver qualifying for this was unable to attend the function. Mr Shipp said that he was proud to represent a company which inspired such loyalty amongst many of its employees, and one where the friendliness and helpfulness of its staff was constantly recognised by members of the public. 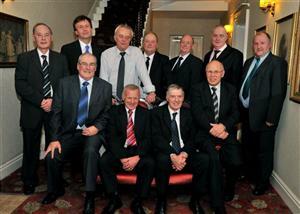 Amongst the recipients were no less than four staff based or formerly based at the company's Withernsea depot. Drivers Fred Dearing and Steven Smith from Withernsea both received awards for 35 years service and driver Adrian Roberts was recognised for his 40 years with EYMS. Burton Graham received an award for a total of 45 years service clocked up with Connor & Graham, and then with EYMS after the East Yorkshire company bought out Connor & Graham in 1993. Burton is the son of Tom Graham, one of the former owners of the Connor & Graham company and, although the former Connor & Graham depot at Easington has now been closed, Burton still lives in Easington but works for the company in Hull, and his wife Josie remains as depot supervisor at Withernsea. Back row, left to right, Hull driver Norman Nicholson (25 years), Parts Division manager John Ellis, Hull detailer Trevor Nicholson, upholsterer Keith Newton, Withernsea driver Fred Dearing, Hull driver Michael Turner and Withernsea driver Steven Smith (all 35 years). Front row, left to right, training supervisor Alan Baron (40 years), planning manager Tony Randerson and engineering technician Burton Graham (both 45 years) and Withernsea driver Adrian Roberts (40 years). 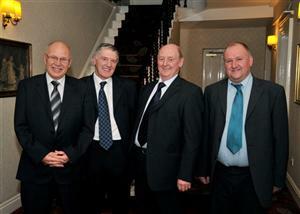 Left to right, Withernsea Depot recipients Adrian Roberts, Burton Graham, Fred Dearing and Steven Smith.